ASA University staff is available to assist ASA members more closely with their training initiatives and programs. For more information on Advisory Service contact Doug Dillon by email or call 630-467-0000 ext. 111. The Advisory Service is tailor-made and can be modified based on your company's specific needs. Below are three examples of ways the Advisory Service has been customized for member-companies. 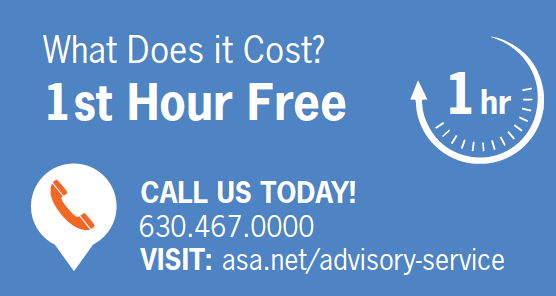 Check out ASA University Blueprint for Success to learn more about what Advisory Service offers. Deployed a new talent assessment tool to use in the interview process. Managers learned how to interpret, coach and connect to training based on the results. Facilitated a training session for managers on the use of On-the-Job Assessments and how to select appropriate training courses, based on assessment results. Created a unique employee on-boarding, retention and promotion program that included the creation of a “Learning Brand” and customized Job Descriptions, On-the-Job Assessments and Curricula Maps for each role within the member organization. Designed a new employee on-boarding process, instituted a company-wide safety program and established employee career pathways. Trained front-line managers and administrators on the implementation and maintenance of the program. We’ve structured ASA-U Advisory Service fees to be both flexible and all-inclusive to member needs since each member’s needs vary greatly. In addition to our distributor members, ASA University is helping Manufacturer members. That way both supply and distribution channels succeed. Advisory Service is different from company to company. When it comes to training—members accomplish the things they want and avoid the things they don’t.